William Koukouras tweeted a picture of his son at the game in Green Bay holding a football while he was standing in the stands before the game. It wasn't his play on the field that left one Cardinals fan smiling from cheek to cheek. Larry Fitzgerald’s incredible third-down catch in the fourth quarter during last Sunday’s win over the Packers is a moment Cardinals fans will certainly remember from this season. But for Arizona fan William Koukouras, there’s another moment from the game that he will cherish for years to come. Koukouras tweeted a picture of his son at the game in Green Bay holding a football while he was watching from the stands before the game. 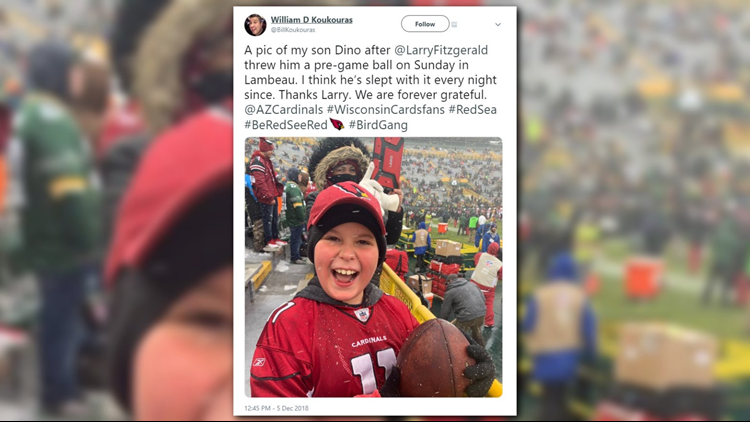 According to the tweet, Fitzgerald gave the ball to his son and Koukouras thanked the football legend for the incredible gift. "I think he’s slept with it every night since," he tweeted. "Thanks Larry. We are forever grateful." And, as Larry does, he followed that up with another kind gesture. Fitzgerald replied to the tweet with his own message of thanks. "William, as players words can't describe how appreciative we are of your unwavering support especially during such a trying year and in enemy territory," the tweet read. "Give your son a hug for me. Happy holidays from my family to yours." In a career filled with milestones and records on the field, Fitzgerald is just as much of a playmaker off the Field. Truly a perfect example of Larry being Larry.